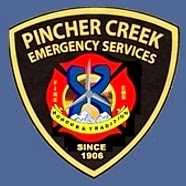 Pincher Creek Emergency Services responded to a motor vehicle collision between two pickup trucks on Highway 6 in the town of Pincher Creek today, Monday September 7, at approximately noon. The collision happened close to Elm Street, one block north of Main Street. The drivers of the two vehicles were the only occupants. One was transported to Pincher Creek Health Centre and the other was released on scene.